Where can I get a patient education video on warfarin? I often am asked by anticoagulation providers the question, "Where can I find a patient education video on warfarin (Coumadin)?" I have provided some links below to a few options on the market. Please note that ClotCare does not support nor endorse any of the products below and does not benefit financially if you choose to purchase one of these videos. I have provided information below from the publisher of each video. 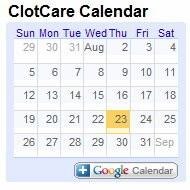 If you know of a video not listed here, please let me know by email at webmaster@clotcare.org. Warfarin: What it is and How Does it Affect Me? Warfarin: What It Is and How Does it Affect Me? is a multi-lingual educational video on anticoagulation for new patients. Covers dosing, side effects, food interactions and when to call a health care provider. Perfect for the hospital or ambulatory care setting. This video explains risks of blood clots and situations in which warfarin (Coumadin) may be prescribed. Medication guidelines are provided including compliance, dietary considerations, and injury prevention. This DVD is approximately 17 minutes in length and covers a lot of the basic considerations but may be overly simplistic in some sections. Where to buy: Contact local Bristol-Myers Squibb representative.